This good because MythTV which already supports HDTV doesn’t include a lot of VDR features. P. S. The DVB card which is going to be used is Technotrend S2-3200 HDTV-S2. MyTellyHD has all the functions you’ve come to expect from a full-featured media server including PVR, Video/DVD Library, Music Library, and Photo Library. But MyTellyHD doesn’t stop there. Now you can save or play a DVD and watch it the way it was meant to be seen high definition 720p component video and its whisper-quiet design elevates your home theater experience. MyTellyHD can even upscale DVDs or recorded video to full HD resolution. MyTellyHD uses Interact-TV proprietary Linux-based media center software. It’s extremely flexible and can run on multimedia PCs or other embedded entertainment commodity hardware. That cool home media center is available just for $899.00. If you don’t want to hear a screaming of your neighbors because your washing machine or bath made a small flood WATER FLOOD ALARM is four you! The principal is simple enough, in case of leaking water, the humidity sensor will detect the fluctuation in the ambient relative humidity and will warn you instantly with a loud alarm tone. 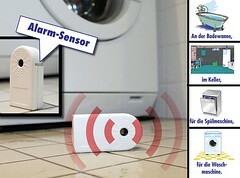 Just place it near washing machine, dishwasher, water pump, bathtub, aquarium, etc and it’ll notify you about the flood. The price of the WATER FLOOD ALARM is 6 EUR (I suspect that it’s dealer price). aOpen miniPC MP945-VDR is ready for HD! AOpen miniPC is perfect to be used as media PC for home entertainment. It’s stylish, quiet and power enough to replace satellite receiver and DVD player in your living room. We tested aOpen MP915-X as Plutohome media director. It’s based on Intel Pentium M processor and it’s good for ordinary TV. When we tried to play HD TV it produced some delays and the video decoding took 100% of processor. Recently aOpen announced MP945-VDR – HD and Vista ready miniPC. It features Intel Core 2 Duo, Intel 945GM OnDie video adapter, Built-in IR receiver, DVI / YPbPr / S-Video / HDMI interface, 5.1 Channel. Additionally it can include TV Tuner, Wireless 802.11 b/g and Bluetooth Module. MP945-VDR seems cool and we’re going to test it with HD TV and Plutohome. I’m not sure about positive result but we should try.